Australia’s wine regions are renowned around the world, and Victoria’s Yarra Valley makes the state stand out for both domestic and international visitors. Offering visitors more than just wine, the Yarra features a range of experiences that will turn your simple winery trip into the ultimate holiday with something to suit the whole family. 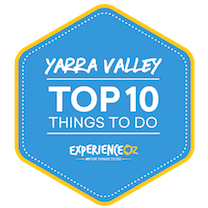 Check out our top 10 to do in the Yarra Valley in rural Victoria here. With all this mention of the beautiful rolling vineyards, it’s only fitting that the number one thing to do in the Yarra Valley is to embark on a winery tour. While self-drive is gaining in popularity, there's no doubting the benefit that being able to kick back and enjoy - without monitoring your alcohol intake - provides. There are a number of operators in the region operating day tours from Melbourne to a handful of popular Yarra Valley wineries for guests to learn about the wine and the wine making process, taste some of the most popular varieties and dine while admiring the beautiful views of the valley. 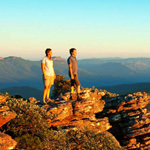 Operator Go West Tours offer quality tours accompanied by guides who are knowledgeable and fun without being pretentious, representing good value for money and limited group sizes to ensure additional personal attention throughout. A gourmet tour perfect for lovers of good food and wine as passengers will be treated to a full day of tastings mixed with sightseeing. Travellers can embark on winery tours which include lunch at recogniseable names in the Yarra such as Rochford Wines, a tour of De Bortoli Wines, a taste testing at Yarra Valley Chocolatier and Yering Station Winery - to name a few. These full-day tours depart from Melbourne in the morning before venturing into the heart of the Yarra Valley to take passengers on a comprehensive culinary adventure. Other winery tours on offer include a combination winery tour and helicopter flight for the more luxurious wine region adventure. Families take note, as kids are allowed on the tours - they just won’t be able to taste any of the wines (of course). Adding an extra layer of spectacular scenery to the proceedings, a hot air balloon flight is one of the most relaxing ways to enjoy birds-eye-views of the Yarra Valley. Operator, Global Ballooning offer sunrise hot air balloon flights which float over the Valley for approximately 1-hour early in the morning to treat passengers to impeccable views of the landscape. A peaceful experience completely different to the two entrants above, a hot air balloon ride is a relaxed and romantic way to see the region. A hot air balloon ride is a peaceful and romantic way to see the region. Whether you are a visitor, a local or are celebrating a special occasion- a balloon flight will not disappoint. For the duration of the flight, you’ll be in the hands of some of the country’s most experienced pilots, while the ground crew looking after you at take off and landing to ensure you have a smooth and calming experience. The option also exists to enjoy a delicious champagne breakfast at the nearby Balgownie Estate after the fight. The buffet style breakfast is the perfect way to cap off a memorable morning. Flights take off half an hour before sunrise from Balgownie Estate with transfers from the Melbourne CBD also available when breakfast is included in your package. A vintage twist on the usual scenic flight option, climbing aboard operator Vintage Airways' authentic 1930s Tiger Moth plane will make you feel as though you’ve journeyed back in time while providing incredible views to boot. Complete with vintage flying gear, you’ll feel on top of the world as you soar over the Yarra Valley dressed in a leather jacket, helmet, goggles and scarf. The flight lasts for 20 minutes and passengers will have the chance to take the controls of the aircraft for part of the flight. Let the smell of fuel in your nose, rush of wind in your hair and a huge smile sweep across your face. This is your chance to step back in time and enjoy old school flying with unobstructed 360 degree views. Once you have contained yourself from the excitement of the whole experience, you’ll be able to truly appreciate the gorgeous views of the region below. This is one of the best ways to take in views of the Yarra Valley without the full adrenaline of a skydive but a bit more adventure than your average flight, this is great for visitors of all ages. If simply admiring the beauty of the vineyards isn’t enough then why not face your fears and try a tandem skydive over the valley? 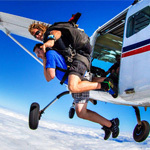 Connected to an experienced instructor you’ll rise to 14,000ft above the Yarra Valley before jumping out and plunging towards this beautiful part of the country. This tandem dive is perfect for visitors to the region looking to add a bit of adrenaline into a visit to a wine region. Tick that item off your bucket list and turn one day into today! Skydiving is one of those life changing experiences that you will never forget! The skydive features up to 60 seconds of free falling where you’ll reach speeds of up to 220km/h before enjoying 5 to 7 minutes of gliding back down with the parachute. Providing breathtaking views of the Yarra Valley region, this is one of the most scenic tandem skydives in the country. Upon completion of the dive, you’ll be issued a certificate to commemorate your adventure. All jumpers must be older than 12 years of age. One of the state’s best animal attractions, Healesville Sanctuary is home to over 200 native Australian animals; you’ll see the likes of kangaroos, emus, dingoes, koalas, wombats and platypus. 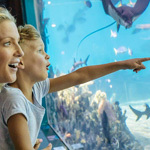 An ideal destination for a day trip from the capital, Melbourne, Healesville Sanctuary has enough to keep you and the kids occupied for the whole day. Healesville Sanctuary is an ideal destination for international visitors looking to get their Aussie animal fix and even locals searching for something fun and exciting to do. The sanctuary also features daily presentations and feeding sessions to teach you about the animals and their habits. With a full schedule throughout the day, you can watch as the park’s keepers showcase some of the animals including parrots, wombats, kangaroos, Tasmanian devils and more! If you’re looking to add a little extra on to your visit to Healesville Sanctuary, you can book a platypus encounter. This additional experience will see you don waders and hop into the water with these adorable animals as they swim around you. You’ll want to get in early with this experience as the encounters are limited to two people a day so the platypus isn’t overwhelmed and can get the right amount of rest. The park is open on a daily basis from 9 am to 5 pm. If you’re looking to stay overnight in the Yarra Valley and are willing to splurge a little, then the Balgownie Estate Vineyard Resort & Spa is the way to go. This 4.5-star boutique resort is Yarra Valley luxury at its finest and offers everything from accommodation and fine dining to a day spa and on-site activities. Encouraging people to stay another day in this beautiful region, you’ll most likely never want to leave once you’ve arrived at the resort. Offering a variety of room options you can choose from the Standard Queen, Directors Suite, Privilege Spa Suite and Garden Terrace. If you’re looking to grab a bite to eat at this gorgeous establishment, then Rae’s Restaurant is where you’ll want to book. Offering settings for breakfast, lunch and dinner you can purchase anything from barista made coffees to decadent dinners. The restaurant is in addition to the cellar door, which you can visit to taste some of the Estate’s best creations. Balgownie Estate’s spa, Natskin Day Spa Retreat, is also a viable option for visitors to the region looking to put their feet up (quite literally) and relax while being pampered. Offering spa and body treatments, facial and skin therapy, hydrotherapy, waxing, tanning and steam rooms to name a few. The estate offers a handful of other activities perfect for those looking to just visit for the day or who have booked a room for a night or two. An alternative twist to standard winery exploration, a Segway tour with Segway Victoria will take you out of your comfort zone while also providing the chance to roam around a vineyard and taste the goods. The two-hour tour takes you around the famous Rochford Winery grapevines under the leadership of an experienced guide. You’ll be given all necessary training to master the control of the Segway so you can safely drive around the vineyard. Along the journey, you’ll learn about grape growing and wine production while also getting a little background about Rochford Winery. a Segway tour will take you out of your comfort zone while also providing the chance to roam around a vineyard and taste the goods. After you’ve explored the vineyard it’s time to put the product to the test with a delicious lunch perfectly paired with one of Rochford’s wines. This is an exciting way to explore a vineyard in the Yarra Valley and is sure to create some laughable moments for those who might not have the best balance. To take part in this tour, all members of your party must be 12 years or over (the glass of wine will be left out for the underage tour members). Located in the heart of the Yarra Valley, the Tarrawarra Museum of Art is a great way to break up the monotony of vineyards and cellar doors (not that one can ever visit too many of the beautiful wineries). Opened in 2003, the museum features a range of contemporary pieces and exhibits that will get you tilting your head to make out pieces and nodding in agreement (or disagreement) all while enjoying breathtaking views looking out over the Valley. Housing personal collections of the founders Eva Besen AO and Marc Besen AO, the museum also hosts various travelling exhibits throughout the year. The museum features a range of contemporary pieces and exhibits that will get you tilting your head to make out pieces and nodding in agreement (or disagreement) all while enjoying breathtaking views looking out over the Valley. If you want a little more out of your visit to the Museum, you can book yourself into an organised tour around the exhibits. The tours will take visitors around to explain the different pieces on display, to provide a more in-depth look at the museum’s current exhibits. All tours must be pre-booked at least two weeks in advance to ensure availability. The museum is open to the public Tuesday to Sunday from 11 am to 5 pm and is also open on public holidays with the exception of Christmas Day. Keeping the active theme going is the Kokoda Track Memorial Walk. Often referred to as 1000 steps thanks to the number of steep stairs, the Memorial Walk is located in Ferny Creek in the Dandenong Ranges National Park. Designed to give visitors a small feel into the challenge Australian soldiers faced following Papua New Guinea’s Kokoda Trail in World War II. Stretching 5 kilometres and taking around 2 hours to complete, the steep trail is often used as a training ground for locals and a challenge for visitors. The trail is designed to give visitors a small feel into the challenge Australian soldiers faced following Papua New Guinea’s Kokoda Trail in World War II. Surrounded by the luscious greenery of the Dandenong Ranges National Park, you’ll pass various types of flora including tree ferns, manna gum and blackwood, and if you’re lucky, some local wildlife. Along the trail, you’ll see various plaques depicting the lives of those who put their lives on the line for Australia in 1942. This journey is educational, emotional and exhausting, and is not recommended for those with medical conditions. One of the most iconic trails in the country, the Lilydale-Warburton Rail Trail travels from the Dandenong Ranges through to the Great Dividing Ranges. Stretching 38 kilometres, the trail is perfect for keen cyclists looking to explore the region. With grades varying from easy to moderate and relatively good conditions, those planning to take the journey will be treated to spectacular views throughout the duration. The trail itself is something of a highlight, with a rich history dating back to the 1900s. The railway line was used to service the local agricultural industry for many years, now instead of bins full of crops, the trail is followed by cyclists, walkers and horse riders. There are various highlights along the way that will act as great rest stops. One of the highlights of the trail is at Yarra Junction’s old railway station. One of the most iconic trails in the country, the Lilydale-Warburton Rail Trail travels from the Dandenong Ranges through to the Great Dividing Ranges stretching 38 kilometres. The station has been converted into a pioneer museum offering visitors insight into the region and how it has evolved. If you’re chasing a cold drink to break up the journey, the Sam Knott Hotel in Wesburn has its doors open serving up a range of cold beverages and has been doing so since its licensing in 1863. The entire trail is complimented by breathtaking views of the Yarra Ranges National Park and its surrounds and curious wildlife. If the whole trail is a bit too much for you, you can opt to complete just parts of it. See the breakdown of the trail below and the distances for each.